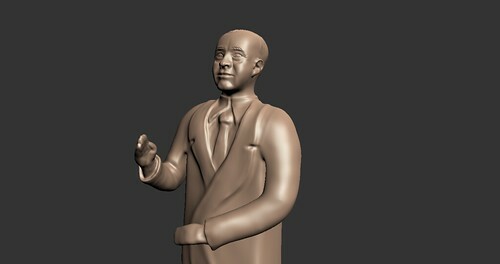 I started sculpting the Edgar Rice Burroughs statue today. Still lots to do, but its a start! Nice outcome. It looks a lot smoother than the old (lego 😉 ) one. Well done, your new skills are definitely showing. Am I the only one that sees a baby face? Might just be the (temporary) lack of detail because it’s WIP. Well its a glossy untextured model. It won’t get much more detailed, just some sculpt marks, slight weathering and some imperfections. But you should Google the man himself, he’s actually bit baby faced in real life, perhaps even more so as he got older. He even has a bit of a flat new born baby head going on. Damn. Looking good as usual. Long time no update. Hope everything is still on track? I’ve been following your project for around a year now and have since acquired a copy of the original Trespasser. I love the intense moments (which is pretty much any time there’s more than “just” one Raptor to fight) and am REALLY looking forward to the remake, especially because the original AI doesn’t hold up as much as I want it to. So anyways, have you decided on how you’re going to visualize the health indicator? I read in an earlier post that you wanted to keep the breasts but cut the tattoo, and that you want immersion to play a big role (which, HECK YES, as long as long as you don’t jump on the “bloody screen”-keratitis band wagon). Thank you for continuing this project and breathing live into something that could have been so much more. Take your time. Hey man, you alright? Long time and no see over at Tresscom. Wazzup man? Every day i checkin the page for news. Are you ok? This looks amazing! If you need any additonal beta testers for this project please feel free to contact me: alanluck@hotmail.com. I previously beta tested for fan projects Vohaul Strikes Back, Space Quest Incinerations, and the Back to the Future MOD for Vice City. Are you also working on JP: Aftermath? I’d love to help out with that project as well in any way I can if needed! I just have to say……..You’re doing God’s work. wow just make this game, its great! thank you! Dude, is everything ok? It has been quite a long time since last update. Take care. Hi newoldmate, it seems to me that you’re quite busy these days, which should be good for your own personal life (I hope, please let us know! ), but the project has been slowed down some what. I just went over and donated some money to you. You really deserve that for the hard work you’ve performed. Of course, with the release of Crysis 3 and Maldo’s tool, there’s an even ‘insaner’ engine out. Tho I still prefer the absolutely ludicrous insanity of possibilities in the CryEngine 2 (for Crysis 1), that dude that took 8k hi-res modded pictures with CryEngine 4 (for Crysis 3) did an awesome job. Ooohhh!! Idea!! Couldn’t you contact the guy who did those amazing 8K Crysis 3 engine shots and work together on this project? Maybe he’d love to do some rendering or whatever. I don’t know exactly how the business works exactly but this might be a great opportunity for the both of you!